The Musée de l'Empéri was started by two passionate collectors, Raoul and Jean Brunon, and contains a total of almost 10,000 objects, documents and books. The history of the French army from 1700 to 1918 is recounted thanks to large-scale historical reconstructions involving 130 life-size infantrymen and cavalrymen. Originally located in the Brunons' family home in Marseilles, the collection was bought by the Army museum in 1967. It was then transferred to the Salon de Provence in a medieval fortress, the Château de l'Empéril. 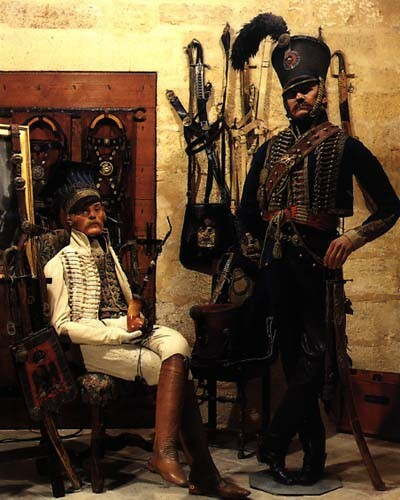 After having visited the two rooms which trace the history of French firearms, visitors enter a series of rooms on the first floor devoted to the history of the republican armies where special attention is paid to the Egyptian expedition and the campaign in Italy. Five rooms are devoted to the history of the imperial epic. In the banqueting hall a number of objects and documents describe the various formations of the Napoleonic army and acts as an introduction to the following rooms which are devoted to the campaigns from 1803 to 1809: the Austrian campaigns of 1805 and 1809, the Prussian campaigns of 1806, and Polish campaign of 1807. A small vaulted room contains some of the most prestigious souvenirs: the Emperor's hat and rosette, the gloves he wore in Egypt, the flag belonging to the first regiment of the Grenadiers of the Imperial Guard who were present at the Moskowa and entered Moscow, the flag Napoleon presented to the army, books from his personal library, signed letters, the souvenirs of Prince Eugene, Mamelouk Roustan, Secretary Méneval, Marshal Davout, Marshal Bessières, Marshall Macdonald and Marshall Poniatowski, etc. There is also a showcase devoted entirely to the Legion d'Honneur. The campaigns that took place between 1812 and 1814 follow. The rooms are deliberately dark to suggest the Empire's downfall and the most sombre moments of its history. The campaigns of Spain (1808-1814), Russia (1812), Saxony (1813), France (1814), the legendary return from Elba, and Waterloo are all evoked with the use of many objects and relics: helmets, uniforms, official letters signed by the Emperor, bulletins of the Great Army, bills, lithographs, maps etc. A small room in the château's main tower displays souvenirs dating back to the Emperor's exile on Saint-Helena Island among which is the gilt bed used by Napoleon in 1819. Five rooms accommodate the Second Empire collections. A general presentation of the army can be viewed in the Ferrier gallery while souvenirs of Napoleon III, Empress Eugenia and of the Imperial Prince are located in “Monseigneur's Chamber”. Visitors will notice the Emperor's hat alongside the complete Grenadier of the Imperial Guard's uniform that belonged to the Imperial Prince around 1864. The last rooms evoke the campaigns in Crimea (1854-1855), Italy (1859), Mexico (1862-1867) and the Franco-German war of 1870-1871. April 16 - September 30: 9:30 a.m. -12:00/ 2:30 p.m.- 6:00 p.m.